Crystal Film Camera Ring Only $3 SHIPPED! You are here: Home / Great Deals / Amazon Deals / Crystal Film Camera Ring Only $3 SHIPPED! Oh my goodness – this ring is SO cute! Right now, you can get this fabulous Crystal Film Camera Ring for just $2.15 + $0.85 shipping! This comes in black and pink (I am SO loving the pink!). 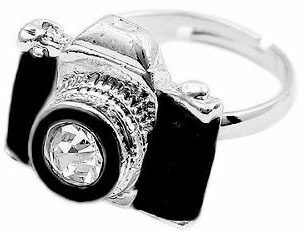 This is the perfect piece of jewelry for all of you shutterbugs or if you know someone who likes to take pictures! And, don’t forget – you can get the matching Vintage Camera Necklace for just $1.49 with FREE shipping!